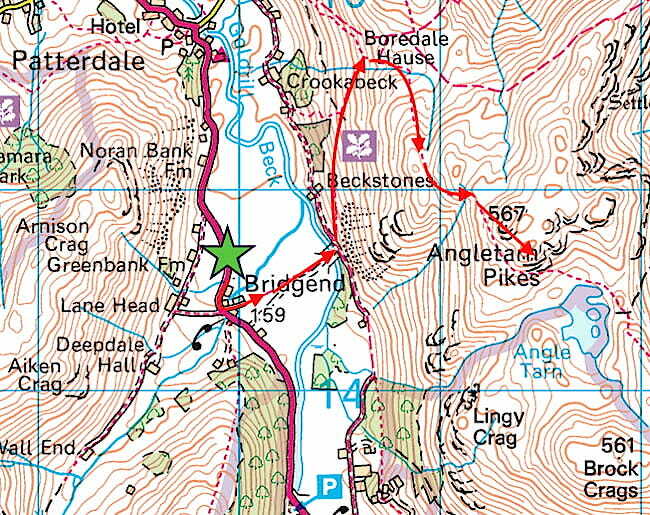 We’re off to visit an old favourite today, Angletarn Pikes. 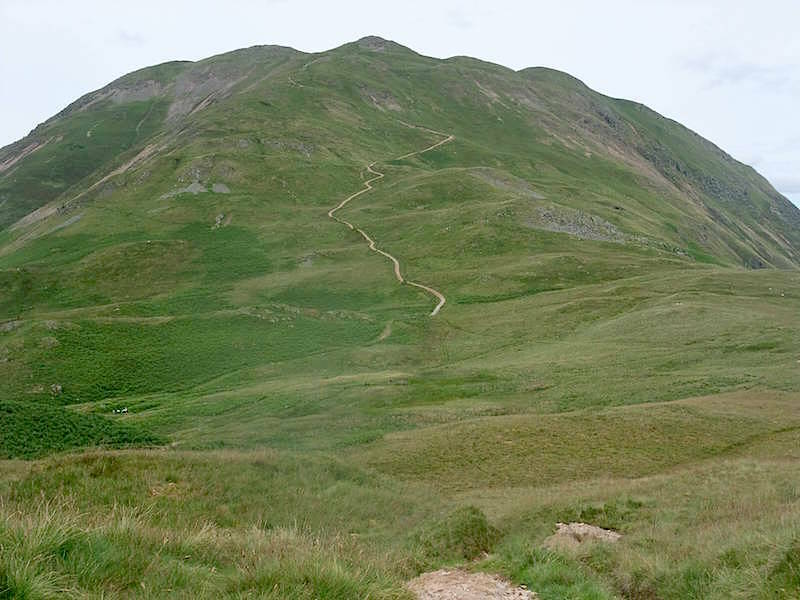 It may not be the grandest but its a lovely little fell involving about 1400′ of ascent from valley level with the path to it taking you across a variety of terrains, and for such a small fell and not a huge amount of effort you get wonderful views in every direction from the top. 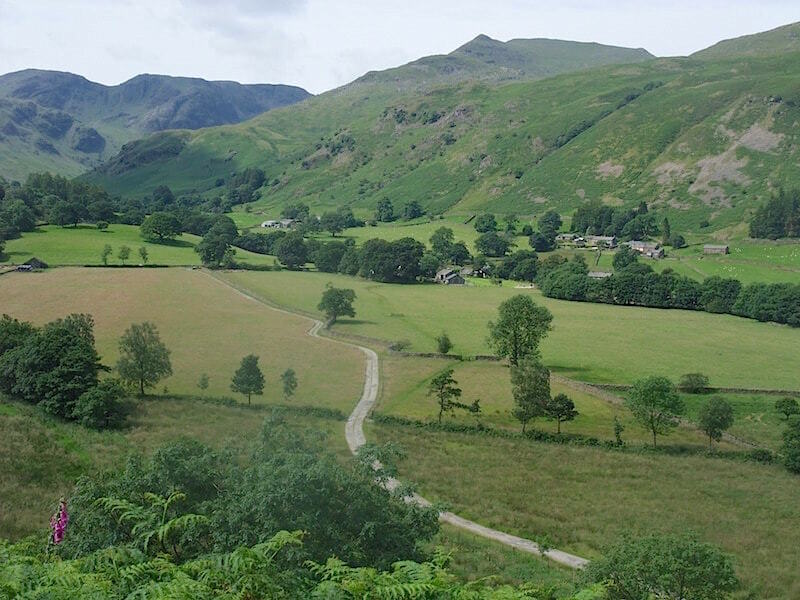 To begin with there is this walk across the flat meadow from Bridgend to the bridge over Goldrill Beck, where it eventually joins up with the path from Hartsop coming in from the right. Looking across to the left as we cross the meadow, the path up there is the one we will be taking. The lower slopes of Angletarn Pikes are to the right, Place Fell is on the left and the area between the two is Boredale Hause. We crossed the beck and joined the Hartsop to Patterdale path which we only stay on for a few yards before taking a right turn and walking up round a couple of hairpin bends. 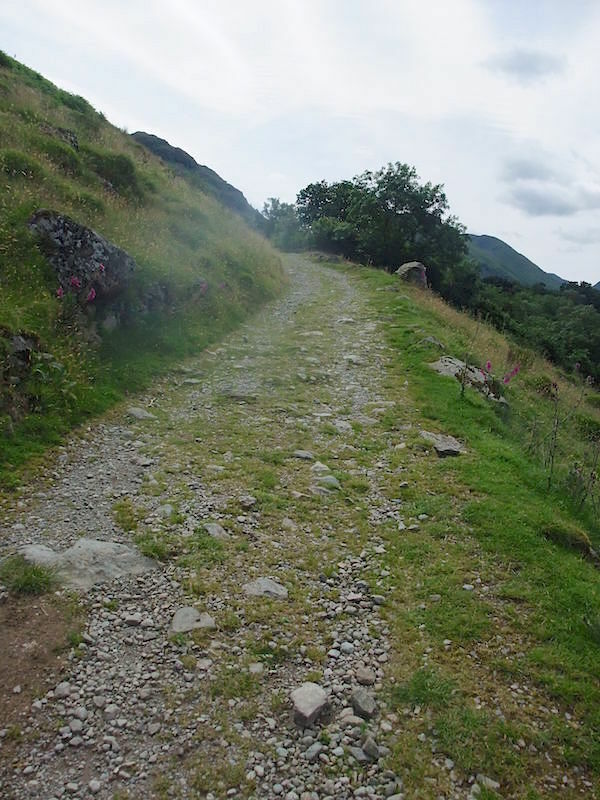 At the top of this track is the last hairpin and from then on its a straightforward climb up the path, shown in the previous shot, to Boredale Hause. The last bit of the path before the Hause tends to have the calf muscles complaining but its quite short so they soon get over it. Here’s a look back at the route we have taken so far. To the right of the farm road you can see the paths through the fields which we were walking along at the start of the walk.The fell with the two pointy peaks over to the right is Saint Sunday Crag. 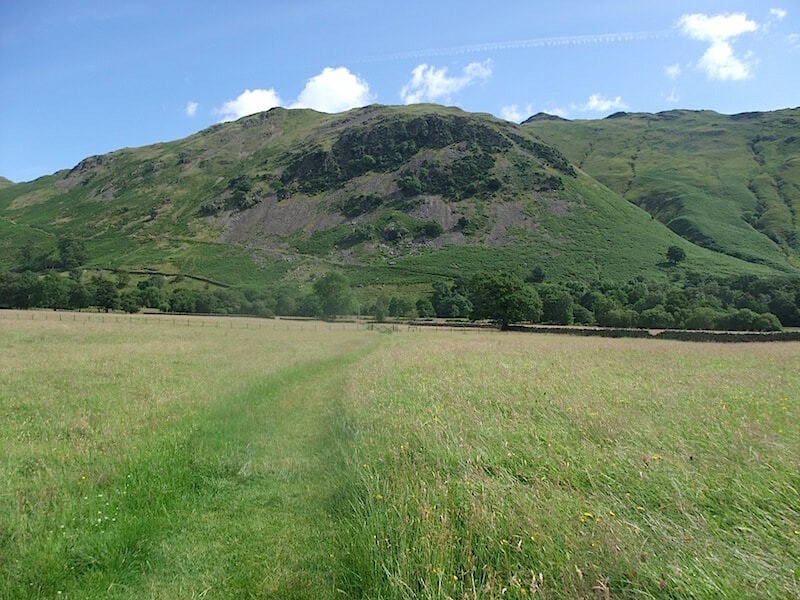 Behind it, over to the left, is the flat top of Fairfield, then Link Hause, the u-shaped dip, and then on the extreme left is Hart Crag. 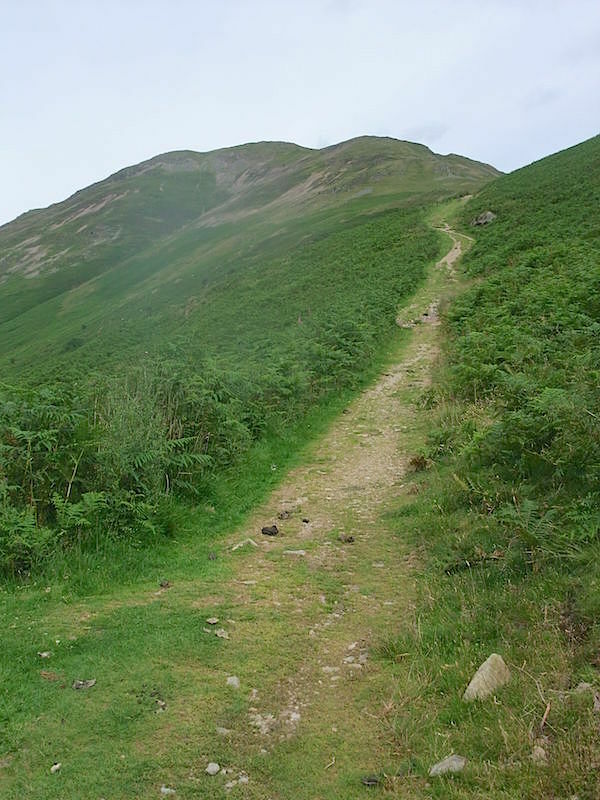 A view up to Place Fell as we make our way up the path to Boredale Hause. Its not excessively steep up here but its a continual steady climb and on a warm, muggy day like today it can feel as though its never going to end. 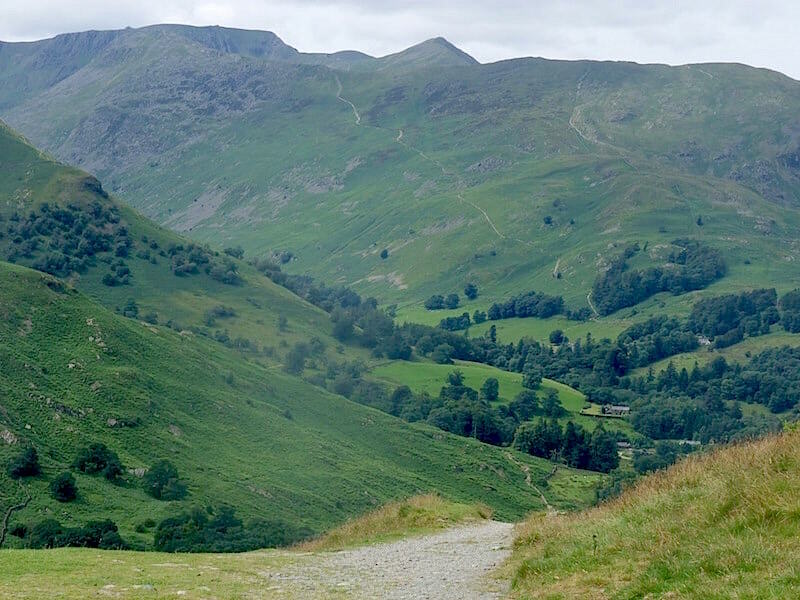 Of course, it does end eventually and Boredale Hause is a large flattish area where you can have a break and take in the view across the valley. The pointed top of Catstycam is sticking up above the ridge of Birkhouse Moor. The path rising up and reaching the ridge just to the left of Catsycam brings you out at ‘The Hole in the Wall’ and the start of the Striding Edge path up to the summit of Helvellyn, that’s the semi-circular one over towards the left. The valley down below is Grisedale. At the Hause we turn right and take the path up to the Pikes from where I took this shot looking back over to Place Fell and the path leading up to the summit. 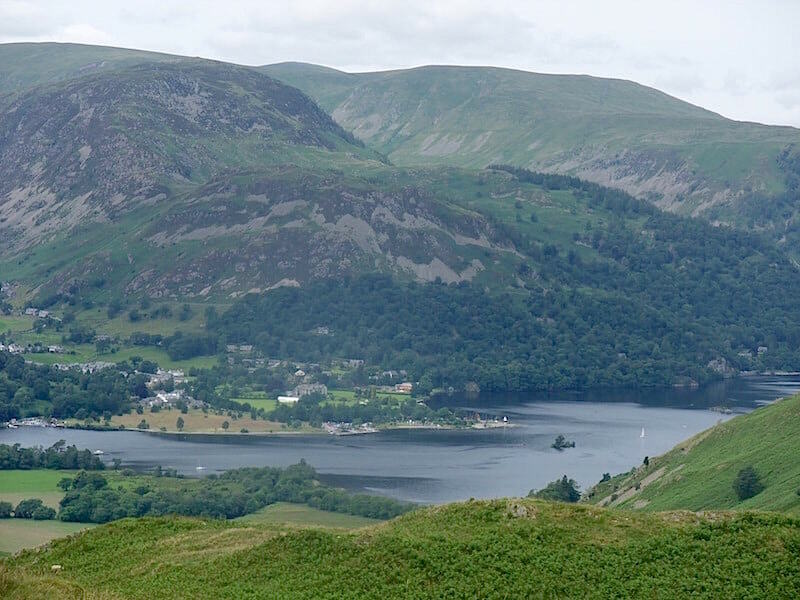 A view of Glenridding across Ullswater from much higher up. 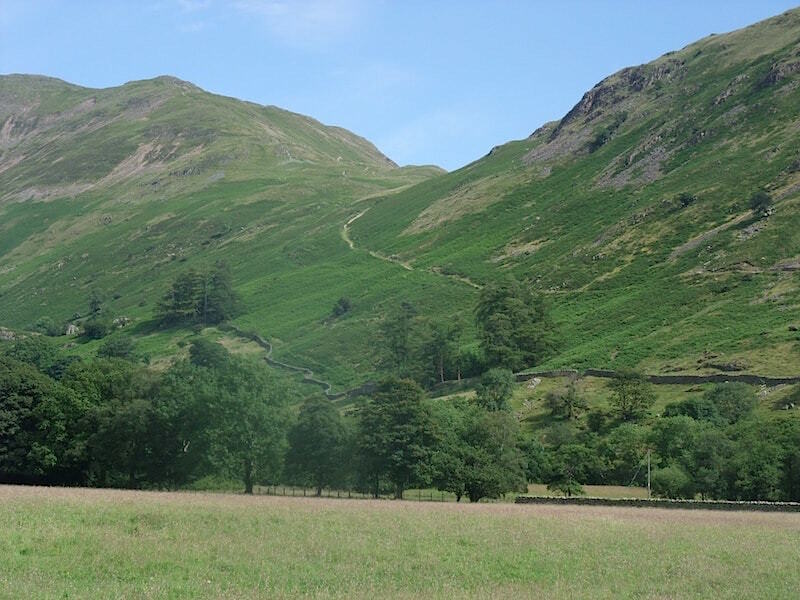 The brown, heathery fell behind Glenridding is Glenridding Dodd, and behind that is Sheffield Pike. 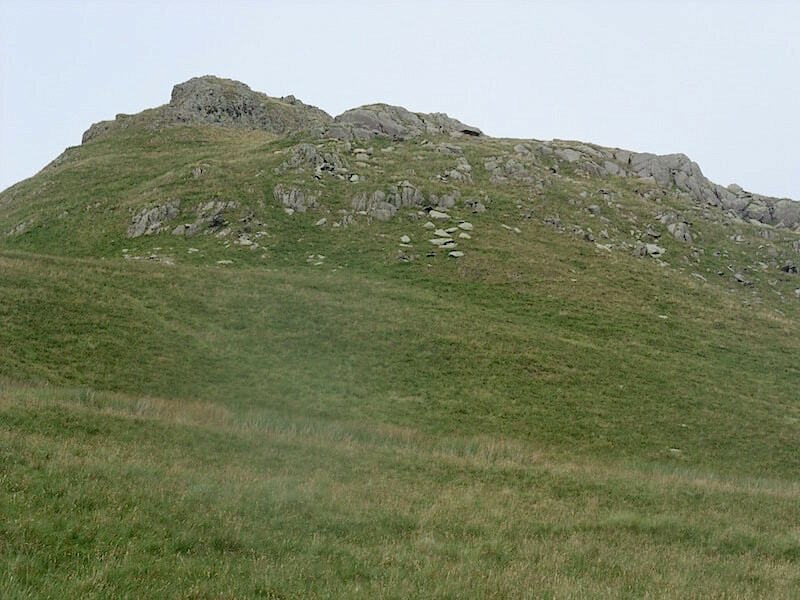 The long, flat fell dominating the right skyline is Hart Side with Great Dodd just in view to the left of it. 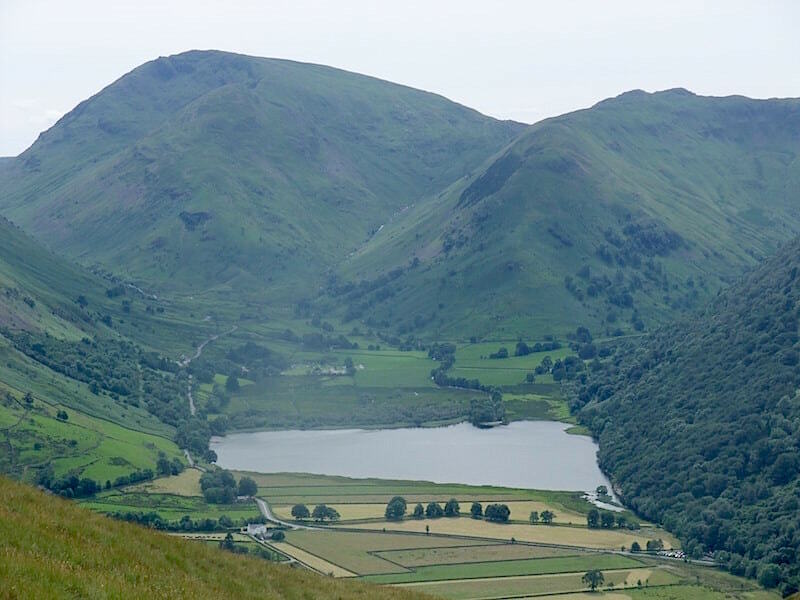 Higher still and there’s a good view of Brothers Water with High Hartsop Dodd to the right of it, and Red Screes, with Middle Dodd just below it, to the left. If the cloud hadn’t come over I wouldn’t have been able to get this shot, as the sun would have been directly in front of me, so I suppose the cloudiness served one good purpose at least. 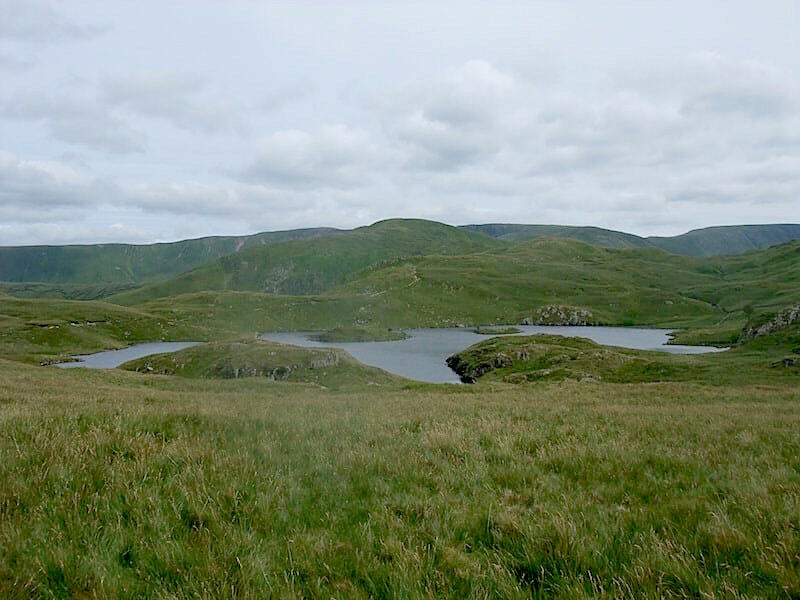 A look back at the south top of Angletarn PIkes as we make our way down the slopes to find a lunch spot with a view of …..
….. my favourite place, Angle Tarn. I must have been keen to get here as I don’t seem to have taken any summit shots, oops. 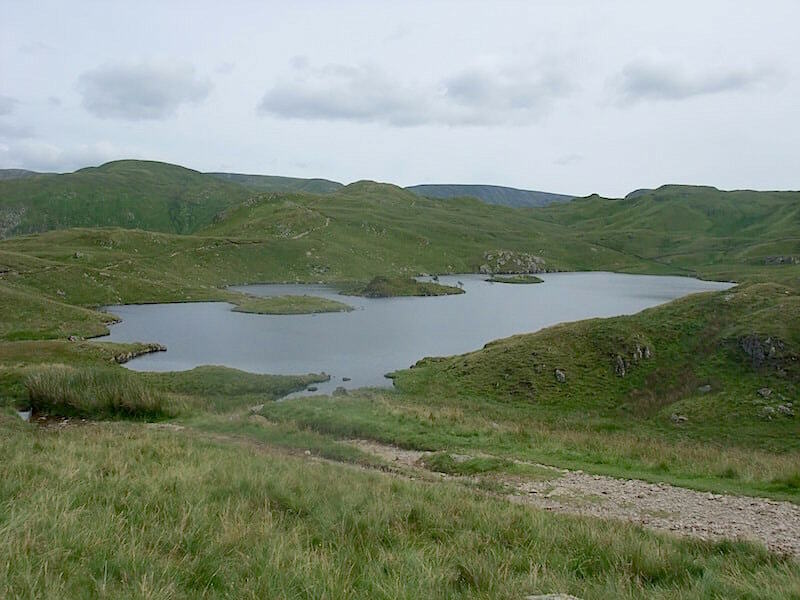 For me the setting and the view is enough, but for anyone who likes statistics – Angle Tarn is situated 1571′ above sea level, it has five bays, two islands, and a narrow peninsula. It measures 420 yards by 285 yards and has a maximum depth of 30′. A sunnier day would have been preferable to show it at its best, but ne’er mind, you can still appreciate the sheer charm of it.